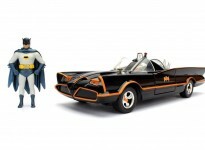 As both the snap and the glue versions of their new 1:25 1966 Batmobile model kits are now out in the world, and the Deluxe version is just around the corner, I asked Jamie Hood from Round 2 Models some questions about working for a model kit company, the project, his involvement and what’s in store for the 1966 Batman license. PMB: Jamie, what is your job title at Round 2? PMB: When did you join the company? JH: I joined R2 in the winter of 2006. We had bought the Forever Fun line of seasonal posable toys and I was the brand manager for those “pop culture” lines. [ed. note: The Forever Fun line makes the Rankin/Bass and Peanuts toys] We picked up slots and models the next year and I moved into managing the sci-fi, fantasy & character lines. PMB: What did you do before joining R2? JH: I worked as a graphic designer in the RV industry. PMB: Is there a typical experience or educational track someone needs to take to work in the plastic models or toy industry? JH: We’re a small company of 30 employees. Right now we have 11 designers working on multiple product lines. We look for intelligence and adaptability as much as design talent. What’s between the ears can be more important than a portfolio. As far as education, you need to know how to use the Adobe suite [Photoshop, InDesign, Illustrator et al.] Luck & timing and play a big part. PMB: So let’s talk Batmobile. Bat-fans, collectors and modelers have been begging for a real, licensed, accurate 1966 Batmobile kit for decades. How did it come about for Round2? PMB: Obviously you guys made decision to go with it. How did you take to the project? JH: I grew up with the show. I love the car. PMB: What were the biggest challenges with the project? JH: The hardest part was getting the parts in the box to look like the car. We were working with tool & model makers in China – people who had never seen the car or an episode of the show. The Batmobile is not part of their cultural history like it is here. Add to that we would go through a project manager who spoke perfect English, but he would then take our instructions and have to interpret them to different people all the time. There were lots of mockups and revisions. During the mock-up revisions there were 500 – 1000 corrections made. Those all take time. Once you enter a licensing contract, it’s a race to get product to market. PMB: When you started the Batmobile project, how familiar were you with what had come before, the many resin unlicensed Batmobile garage kits that have been released over the years? Had you ever built or owned or had any experience with any of them? JH: I was aware of them and some were sent to me to take a look at as I developed the kit. Honestly, I wasn’t terribly impressed by anything I saw. Despite the amount of effort put into them, they didn’t seem very accurate to my eye. I couldn’t really find much in them to latch onto. PMB: When the announcement came out that R2 was going to do something more than just reissue a larger version of the old Aurora Batmobile again – the expectation level in the ‘bat-community’ rose pretty quickly. And with all the mistakes made and apathy that Mattel had shown as far as listening to fans about their 1:18 diecast metal car – many of us were skeptical that we’d ever see a plastic kit with the attention to detail the car deserved. What we got, with no exaggeration, was the most accurate Batmobile scale model ever made. How did you research the car and what was that process like? It’s been written and assumed that you got access to and used Mattel’s [Hot Wheels] digital scans of the full-sized car. But having seen the model, I find that unlikely. JH: We did not use the Mattel scans. And we didn’t scan and resize the 1:18 Hot Wheels model. The model-toolers were given loads of photos, measurements, models and information to work from. I thought I could visually correct anything using photo-references. But the details of the Batmobile are so organic that it was difficult to communicate. We had a lot of help from Eric Seltzer [1966batmobile.com] He and his associates had actual measurements and tons of photos of the original car. Any questions we asked were answered with good responses. PMB: When the pictures came out of the mockups, the Batmobile “community” barraged the forums with a boatload of corrections, opinions, and demands. And then the snap kit was released and certain things had gotten fixed and some others – did not. And while most modelers and collectors were ecstatic to just have the model, there was an inevitable backlash of criticism about some of the details. What’s your response to the nitpicking? JH: As long as I can do something about it – the input is good. I saw about 80% of what was being said and tried to do something about most of it. The other 20%… Well, I had to pick the things that were: A) Most important to the look of the car. B) Easiest to modify by most modelers. So – while things like the batphone pedestal aren’t perfect – many modelers can modify that themselves, so we let it go. But it’s really hard to address issues with clear plastic. So we revised the rear canopies. We kept pushing back the release date, because I kept asking for revisions. We were under a lot of pressure to get it done. At one point in the process I lost track of the engine revisions. It doesn’t look anything like the one I sent. The carb looks nothing like the original. The beacon was revised multiple times and they just couldn’t get it right. Looking back, I should have taken apart the mock-up more. A resin mock-up is very fragile and I didn’t want to handle it too much. There were so many things wrong with the test shot – the rocket tubes were mounted facing backwards. There were several “Oh Crap” moments where we had been looking at something for a while and just realized it was wrong. At some point we had to call it and just get the model out. Stay bat-tuned for Part Two of Pimp My Batmobile’s interview with Round 2’s Jamie Hood for more insider scoop about the 1:25 1966 TV Batmobile models project, including working with Alex Ross, the upcoming deluxe kit version, future plans for other bat-kits and more in-progress photos. One of many photo-reference revision notes sent to the toolmakers by Round 2. Nice! Can’t wait to hear what’s in store for the brand in the future!